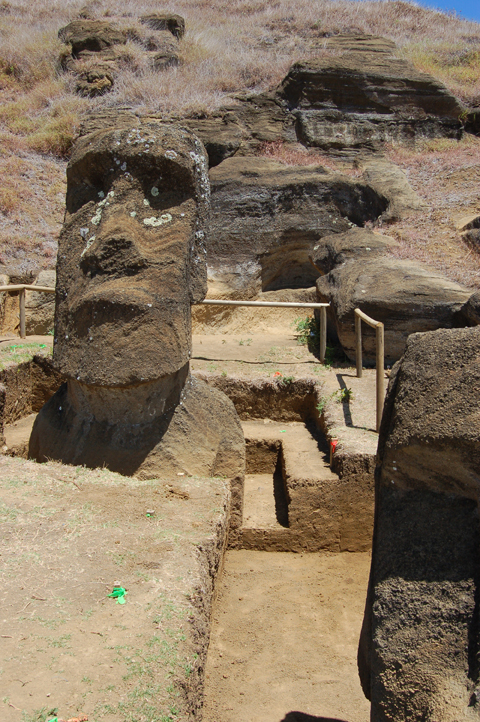 Subsequent excavations of this statue are not published, but it is highly probable that at least some digging was done around or near the statue after 1914-15. Our Historic Level Book contains photographic documentation from the collections of Alfred Métraux and Henri Lavachery (Franco-Belgian Expedition of 1934-35), the Crocker Expedition of 1935, the Lorenzo Dominguez Archive of 1960, and our own EISP Archives beginning in 1981. From the lowest level of the previously excavated historic levels to the statue base and possible pavement we will be in unexcavated archaeological levels. Items of greatest interest located in those levels are anticipated to include carbon, pigment, and human bone. Detailed drawings of the stratigraphic levels will be made, as will field and finished drawings of the petroglyphs and, if present, any pavement in place under and next to the statue. Complete new measurements will also be taken of the 55 attributes usually recorded by EISP on all statues. A discrepancy is anticipated to exist in the measurements taken by Routledge of, for example, the total height of the statue and the actual height and other dimensions of the statue. The new measurements taken by EISP will constitute the final metric record. Level bags are acid free dry sample Kraft paper envelopes in three sizes with fold-over metal ties. Vials are 12 dram archival safe clear plastic with snap-on white lids. The vials are all stored in level bags and given the same number as the level bags. Bags collected are numbered consecutively from one to the final number, which was 235. They are sorted by unit, square, level and date and stored by Unit in the EISP Field Office, Mana Gallery, Hanga Roa. The I.D. number assigned to each bag consists of the statue identification and the bag number (RR-001-156-001, for example). Objects and artifacts are washed in clear water and dried before final storage. The contents are given on the outside of each bag. 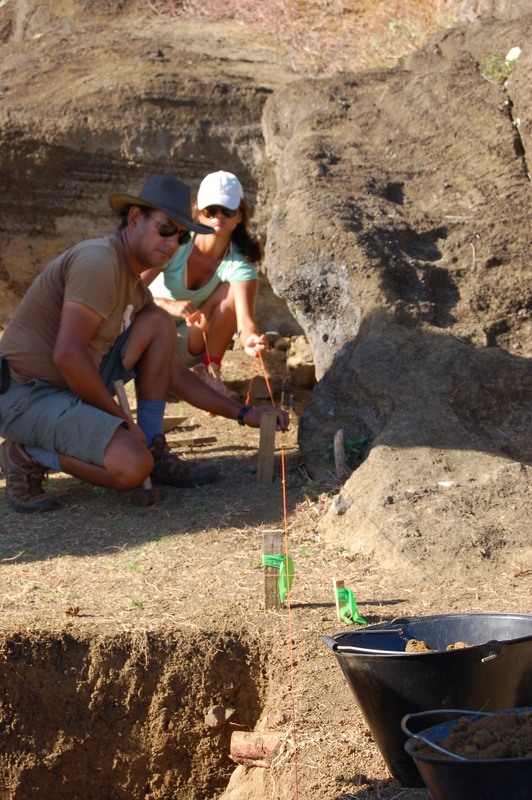 The excavation grid was re-established by Jo Anne Van Tilburg and Cristián Arévalo Pakarati in accordance with the previous season. The grid was repeatedly evaluated or tuned throughout the excavation process, and excavations in Square 4, Unit 157, united the two separate grids. The dirt removed from the excavation was screened through a 1/8th screen and objects recovered were bagged and logged using a unique field identification number which includes the Unit (or statue) number. All objects thus recovered were washed, counted, logged by material and, in some cases, photographed. The backdirt removed from RR-001-156 was stored near to but separate from that removed from excavation of RR-001-157. 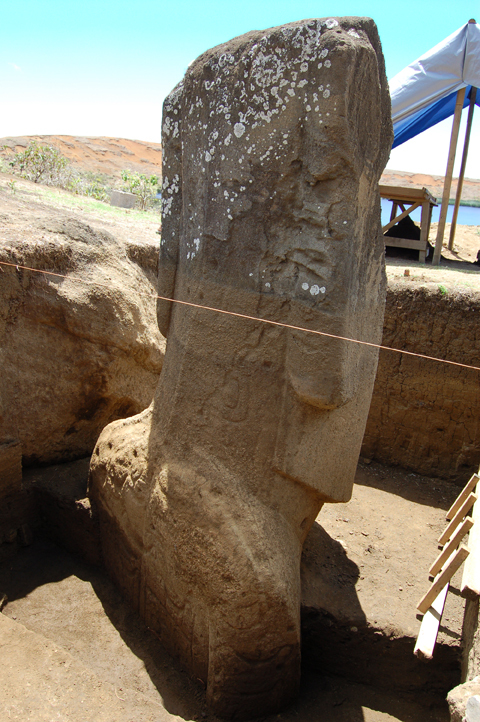 All recovered material was temporarily stored in the EISP Field Office at the Mana Gallery, Hanga Roa, until the end of excavations, at which time it will be removed to a designated, secure storage area as specified by CONAF and the local Consejo de Monumentos. At the beginning of each excavation season the previously excavated units are shovel scraped to remove accumulated dirt. In this case, 5 buckets were removed and screened prior to re-initiation of excavation. A digital photographic record is made of the excavation process, the staff included in that process, the tools used, the objects collected, on-site visitors and tourist activity, etc. These images are filed in a daily photo log and then transferred with full documentation attached to the EISP Image Database (now containing over 50,000 images). Specific techniques for documentation of certain objects in the Excavation Finds Log are given below. First and last photos of each day in the field are taken and the time of the photograph recorded. The Excavation Finds Log assigns a pre-printed FO number to each field object collected as a single object and not contained within a level bag. Each object is then photographed in a standard manner. Toki are measured in a standard manner and the measurements recorded on a field diagram. JVT demonstrated and instructed Vai in the Excavation Finds Log, the level bag inventory and register, and photographic procedures. This record-keeping was her primary responsibility. The Excavation Finds Log contains for the season 94 entries from 5 February to 25 February. Of these, 78 are toki. One toki had fused metal on its surface . 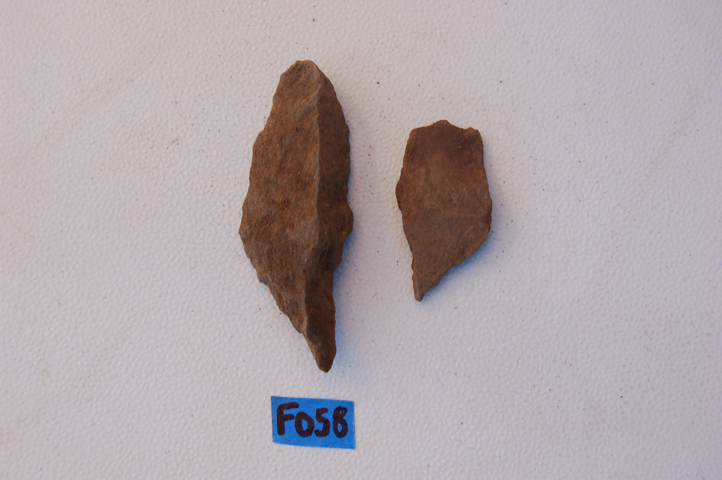 Several examples of an interesting object that may be a scribing or perforating tool (more probably the former) were previously documented in the excavation of RR-001-157. They are made of either basalt or obsidian and consist of a rough and varying shape with a single, sharp and flaked point. Their fortuitous shapes recall the varied shapes and flaking techniques used to make mata’a. Several of these were found during the excavations reported here. The dates of most recent fires in the interior of Rano Raraku are recorded in the EISP archives by reference to historic photographs. The most recent large fire was on the exterior of the quarry in January, 2011. Routledge (RGS/WKR) reported carbon in her field notes “just below the surface,” at the “5 inch level at 4 feet” from the back of the statue, as well as “at the 18 inch level” and at what she states are 2, 3, and 4 feet levels. Thus, we expect to find quantities of carbon throughout the various previously excavation levels in disturbed contexts. Theoretically, below her 4 foot level the carbon should be in previously unexcavated levels. Nonetheless, our objective is to collect carbon samples from each level for each square, if possible. Skeleton of which long bones, base of skull and patella were identified. Position: head to the right of the statue and long bones to left of statue. In the process of attempted removal the bones were damaged and, presumably, returned to the excavation. 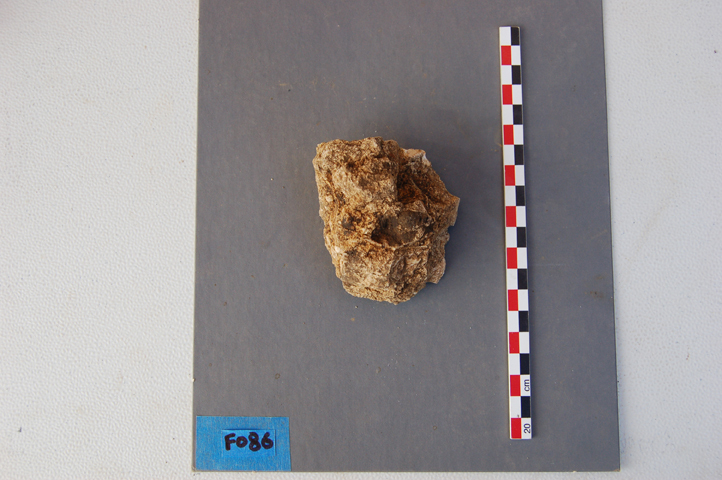 We note, however, that a fragment of what may be a patella was located by us during the previous field season in one of the carving canals of Quarry 2. This suggests the probability that at least some of the bones were simply cast aside rather than replaced at their proper level. Samples of both carbon and bone are identified during our excavations by both digging and screening, and are collected with gloves and/or metal tweezers and stored in archival safe plastic vials. Quantities of carbon often are revealed by floatation during the washing of level bag contents. The majority of bone is found in fragments. The protocol for reporting, collecting, and storing human bone is unclear to this project. Some materials are archived in the island’s local museum, but recent unsettled political conditions on the island create doubts about collection management. There is the wide-spread belief that this material in the museum’s collection is not archived properly or according to best practice standards. Informal conversation with an archaeological colleague currently working on another site on the island suggests that CODEIPA should be informed. Logic dictates that CONAF should be informed. This and previous reports, copies of which are provided to CONAF and CMN, fulfill our obligation to report finds of human remains. We interpret the burial at 75 cm in Square 10 as post 1914-15. It is certainly historical and probably after 1955. Its discovery was reported verbally to Sonia Haoa Cardinali (CMN) in her office and in the presence of Lilian Gonzáles N. On their advice we re-buried it after fully documenting it with field drawings and measurements and in our photographic record. As of this writing, human bones retrieved through our excavations are treated to archival safe storage, duly logged completely and clearly with other materials, and stored in the EISP Field Office, Mana Gallery, Hanga Roa. 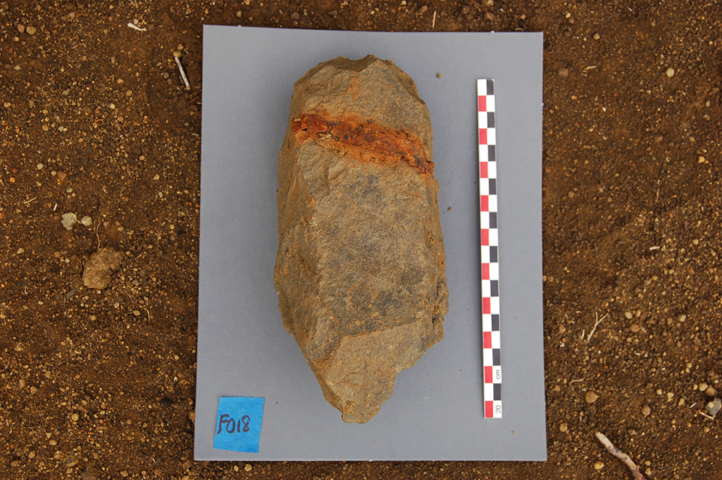 Cultural material refers in this case is limited to basalt chips and flakes as well as to apparent toki fragments. The wall to be drawn was photographed. A Munsell reading was taken on the mid-point of the papa on west side of statue and recorded as 10 YR 7/4. Some darker areas are mainly because the papa contains some water. Dark blackish gray-dark gray to black exposed conglomerate containing lichens. Both shoulders have been abraded or rubbed (horses) to expose underlying yellow lapilli. Brown to light brown level with surface pulverization. Cupules are present at Levels A and B. Dark brown pulverized stone surface with some delamination (due to carving process damage?). Our original fence was illegally removed in May, 2010, and we have since re-installed a portion of it. This fence needs to be upgraded, and we will do at least some of that during March, 2011and after the conservation work described separately is completed for the season. Our public education efforts took the form of placing a general information sign on site, which many tourists actually took the time to read. We also distributed educational brochures to interested tourists and allowed complete access to our site as well as taking time out of our day to lecture or otherwise meet and greet tourists. 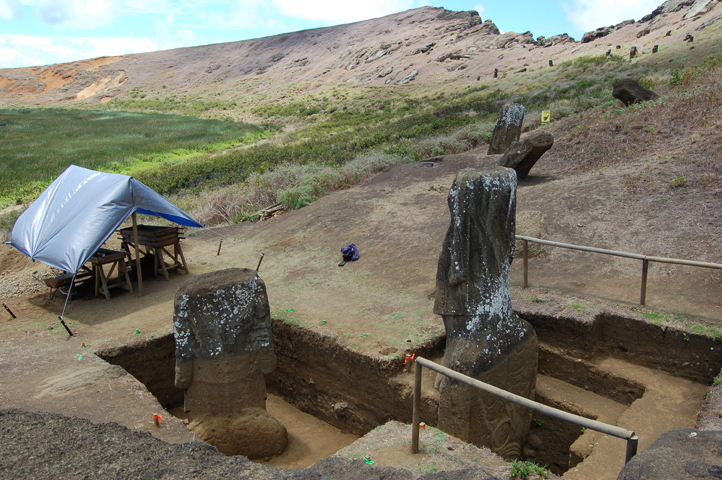 The integrity of our excavation site was breached in 2010 when it was vandalized and equipment damaged and illegally removed by a dissident group of Rapa Nui people. The protection of the site and the safety of visitors to it is the exclusive obligation of CONAF. Isaías Hey Gonzáles, 18 years old. Previous field experience was with Sonia Haoa Cardinali and Lilian Gonzáles on their field survey team. Joaquin Soler Hotu, 22 years old. Previous field experience is one season with Dr. Vogt on the Avanga Uka field team. His main interest is conservation. Rafael Paoa Rapu, 22 years old. Previous field experience includes working with Dr. Chris Stevenson on the Maunga O Koro project; José Miguel Ramirez on a CRM project; and one other CRM local project. His main interest is in lithic analysis. Tiktehatu Astete Paoa, 24 years old. He has worked with Dr Burkhard on the Avanga Uka project, the field survey with Sonia Haoa Cardinali, and one local CRM project. His interest is landscape archaeology. Felipé Rubio Munita, 25 years old. 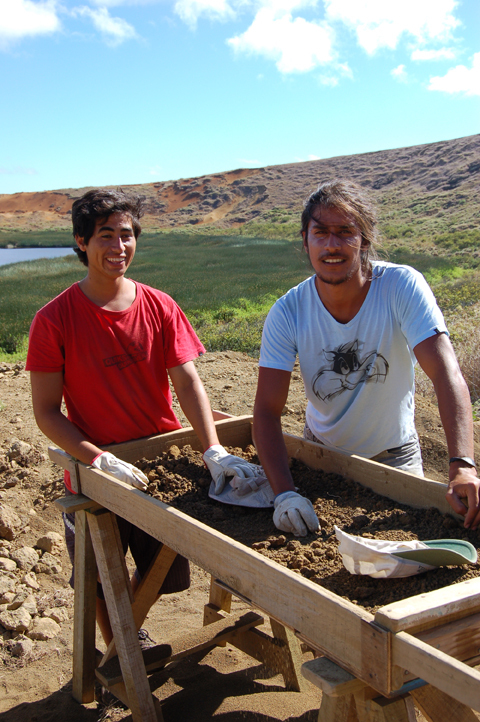 He is a fourth year archaeology student with previous experience in three mainland Chile excavations. The students will be paid US $40.00 per day and provided with transportation to and from the site, breakfast, and a catered lunch daily. A satisfactory evaluation and a commitment of 54 hours of participation will earn the student 2 university credits and a Certificate of Completion from EISP. 9:00 AM Breakfast at Rano Raraku camp re-established from last season by Dario and maintained by Rosa Lucia Ika Paoa and Anastasia Ika Paoa. Half of Square 4 from 20 cm to 100 cm and then half from 80 cm to 175 cm This square is the unifying point between the two units and their respective grids (see Figure 4b, above). Half of Squares 7 and 11 to 60 cm and 66 cm level, respectively, in order to lengthen the profile drawing from Square 19. The drawing will now include Squares 7, 11, 15, and 19. Square 2 160 cm There is a slight bulge in the near-middle of the square. Square 7 220 cm The west sidewall contains 1 large poro, 3 medium-sized pieces of tuff and on the floor of the square there is a slab of what appears to be keho. If so, it is an indication of a possible burial. Square 10 150 cm, with human burial covered with about 30 cm of backdirt. Therefore, the level of that half of the square is now 120 cm from the surface.